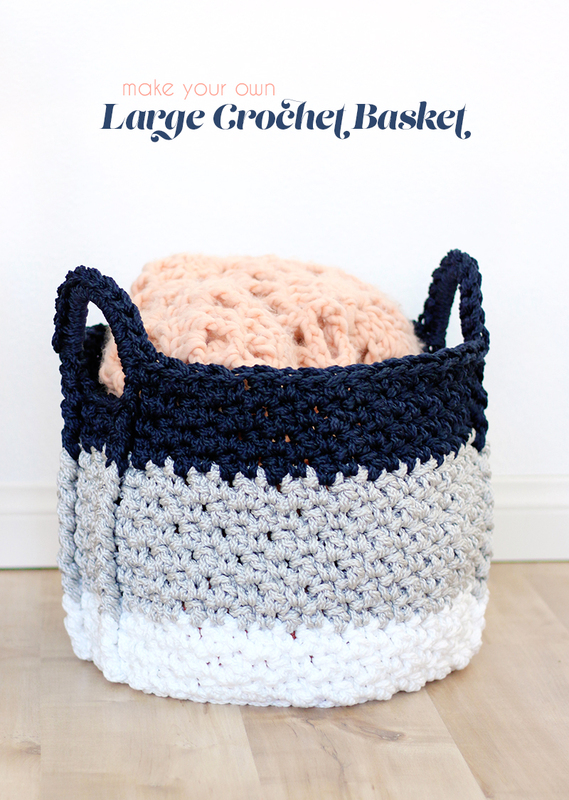 Learn how to crochet your own large crochet basket! 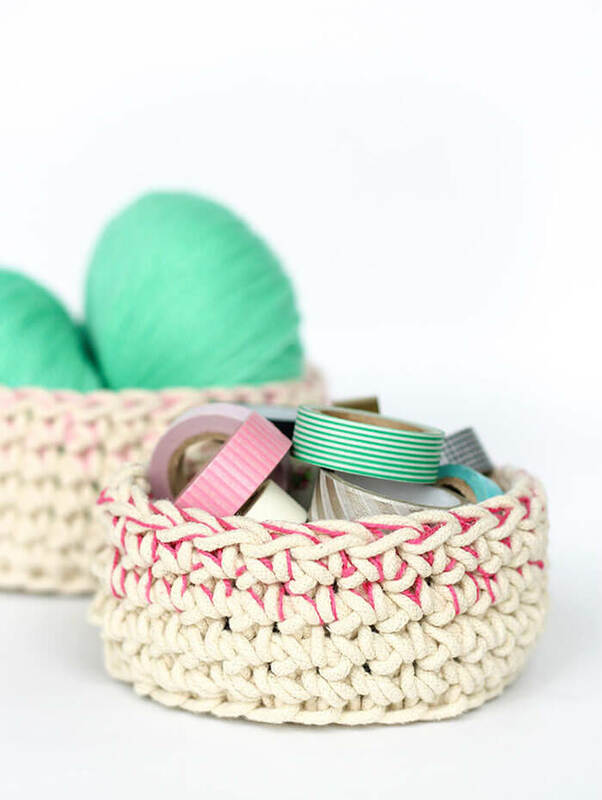 This free pattern is easy to follow and works up quickly so you can make custom baskets for every room in your house! 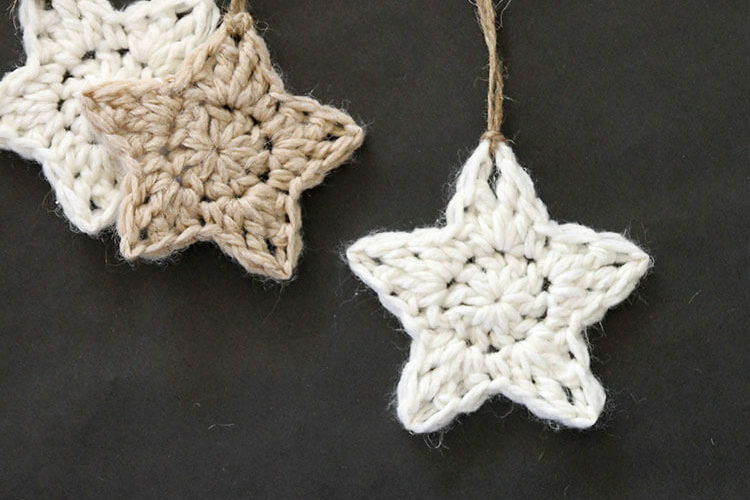 I originally shared this pattern at Crafts Unleashed. This post contains affiliate links which help to support this site. Thank you! I remember as a kid thinking it was weird that my mom had so many baskets. Like what are all these baskets for? What do we need these things for? Why are their baskets on the walls? On the floor? Everywhere? While it baffled me a bit as a kid, I now definitely understand the appeal of a good basket. In fact, I would definitely say I’m becoming something of a basket lady. 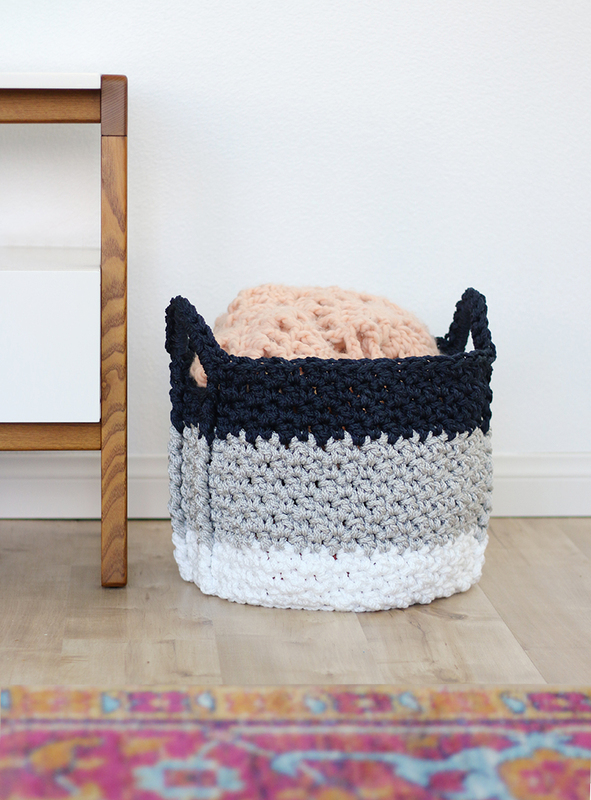 There’s just always so much stuff, and baskets are the perfect pretty solution for hiding organizing that mess. Plus I love the texture that baskets bring into a space! Beautiful natural fibers and woven details – swoon. Of course, I have my fair share of crocheted baskets around my house, but most of them are on the small size. 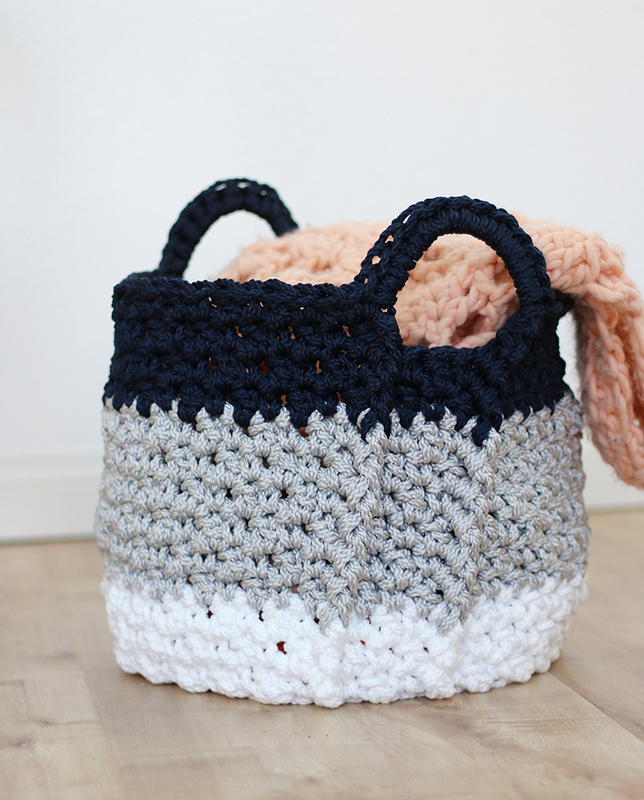 Today, I’m sharing my latest basket pattern, and this time it’s a nice, large crochet basket. The finished basket is about 14″ in diameter and 14″ tall, which means it’s perfect for holding extra blankets or corralling stuffed animals in a kids room. I used large macrame cord to make the basket, which comes in lots of fun colors, so you can change the basket to fit any room in your home. 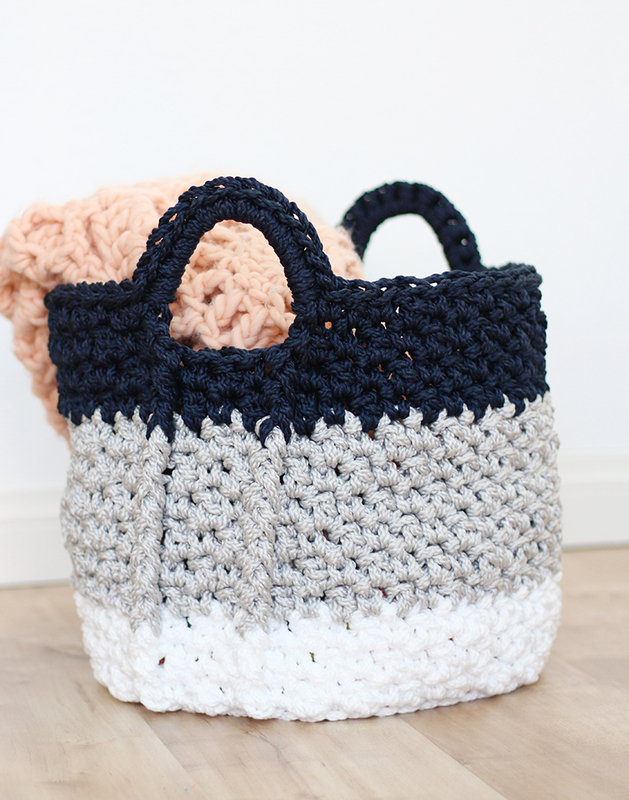 I did my basket in three colors, but you could totally do it in a solid color too. 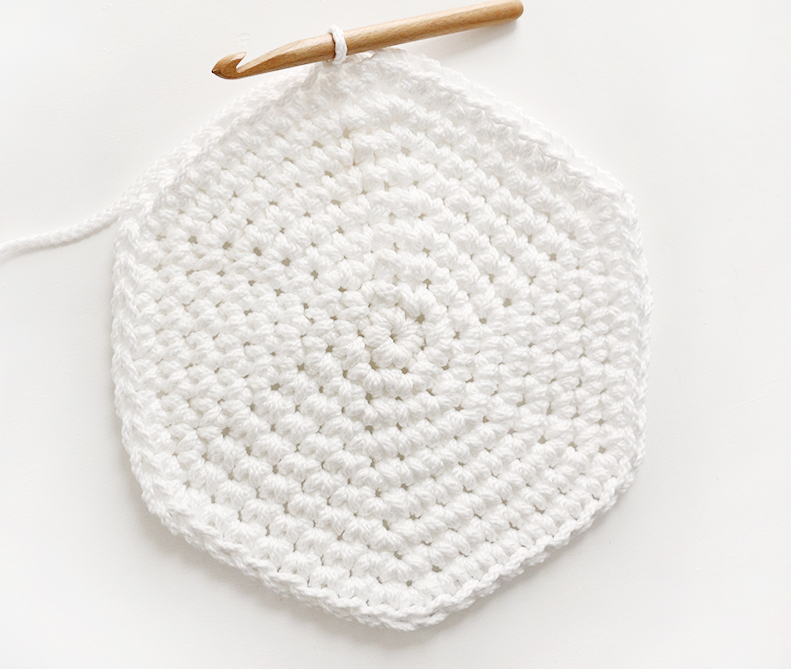 Ready to crochet? Please Note: My patterns are free for personal use. You may sell items that you make from the pattern as long as you include a link back to the pattern when possible. Please do not sell or redistribute the pattern in anyway. 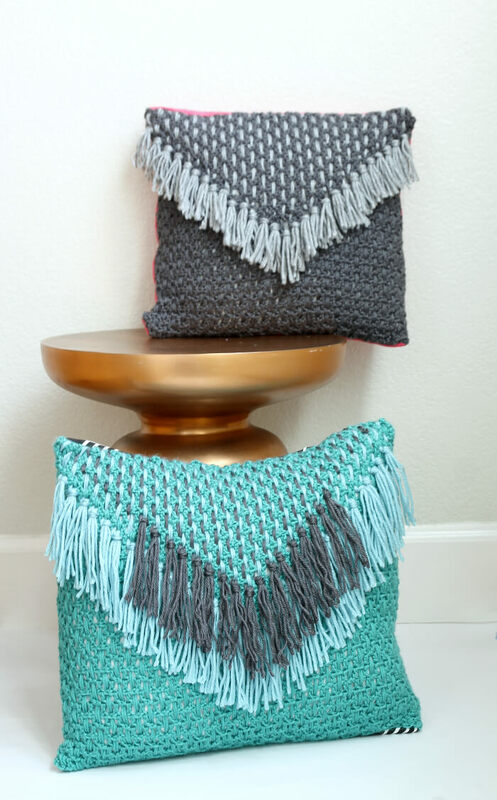 If you want to share the pattern with a friend, please just send them a link. Thank you for your support! Front Post Double Crochet (fpdc). The front post double crochet is worked just like a regular double crochet. 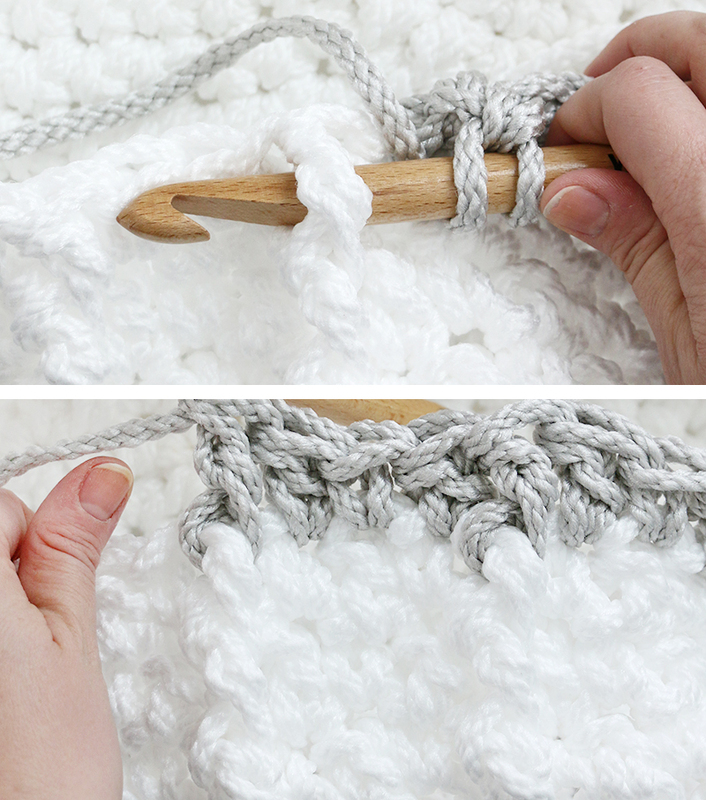 But instead of working the stitch into the top of the stitch from the previous row, the stitch is made by inserting the hook around the post of the previous row’s stitch from front to back. (See image below.) This raises the stitch up above the rest of the stitches. Round 1. With Color A, ch 2, 6 sc in 2nc ch from hook OR work 6 sc in magic loop, sl st to join (6 sc). Round 2. Ch 1, 2 sc in same st, 2 sc in each st around, sl st to join (12 sc). Round 3. Ch 1, sc in same st, 2 sc, *sc, 2sc, repeat from * four times (18 sc). Round 4. Ch 1, sc in same st, sc, 2 sc, *sc, sc, 2 sc, repeat from * four times (24 sc). Round 5. Ch 1, sc in same st, sc, sc, 2 sc, *sc, sc, sc, 2 sc, repeat from * four times (30 sc). Round 6. Ch 1, sc in same st, sc, sc, sc, 2 sc, *sc, sc, sc, sc, 2 sc, repeat from * four times (36 sc). Round 7. Ch 1, sc in same st, sc, sc, sc, sc, 2 sc, *sc, sc, sc, sc, sc, 2 sc, repeat from * four times (42 sc). Round 8. Ch 1, sc in same st, sc, sc, sc, sc, sc, 2 sc, *sc, sc, sc, sc, sc, sc, 2 sc, repeat from * four times (48 sc). Round 9. Ch 1, sc in same st, sc, sc, sc, sc, sc, sc, 2 sc, *sc, sc, sc, sc, sc, sc, sc, 2 sc, repeat from * four times (54 sc). Round 10. This round is worked in the back loops only (see image below). Ch 1, sc in same st, dc, *sc, dc, repeat from * around, sl st to join (54 stitches, alternating sc and dc). Note: The basket’s sides (excluding the handles) are worked in what I call a lemon peel stitch. The Lemon Peel stitch alternates single crochet and double crochet stitches always working sc in dc and dc in sc. Round 11. Ch 3 (counts as dc), *sc, dc, repeat from * 4 times, fpdc, dc, sc, dc, fpdc, dc, **sc, dc. Repeat from ** 9 times, fpdc, dc, sc, dc, fpdc, ***dc, sc, repeat from *** 5 times, sl st to join. Round 12. Ch 1, sc in same st, *dc, sc, repeat from * 4 times, fpdc, sc, dc, sc, fpdc, sc, **dc, sc. Repeat from ** 9 times, fpdc, sc, dc, sc, fpdc, ***sc, dc, repeat from *** 5 times, sl st to join. Rounds 13 – 21. Alternate Rounds 11 & 12, ending with Round 11. I changed to Color B at Round 13 and to Color C at Round 19. Round 22. Ch 3 (counts as dc), *sc, dc, repeat from * 4 times, fpdc, ch 8, skip next 3 sts, fpdc, dc, **sc, dc. Repeat from ** 9 times, fpdc, ch 8, skip next 3 sts, fpdc, ***dc, sc, repeat from *** 5 times, sl st to join. Round 23. Ch 1, sc in same st, *dc, sc, repeat from *4 times, skip fpdc, work 12 sc over ch 8 sp, skip fpdc, sc, **dc, sc. Repeat from ** 9 times, skip fpdc, work 12 sc over ch 8 sp, skip fpdc, ***sc, dc, repeat from *** 5 times, sl st to join. Finish off. Weave in ends. That’s it! Fill up your basket with blankets, pillows, stuffed animals, or whatever you need to store. It would be pretty cute holding a plant too. That’s kind of my favorite way to use baskets lately. Well, one of my favorite ways. I’m telling you – total basket lady! 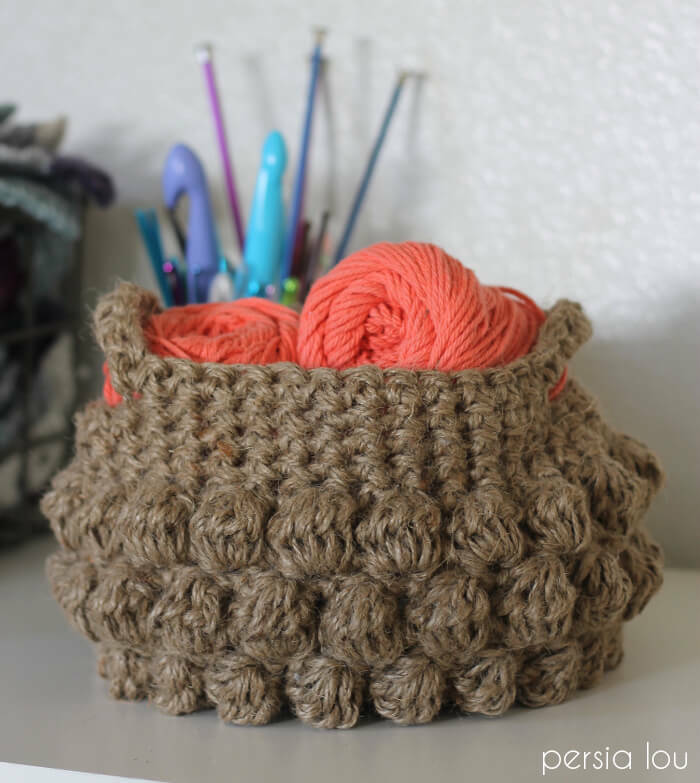 I really would love to crochet this basket. I like the colours you used. I also liked the Beanie patterns you shared on Darice Craft blog. You are really talented. 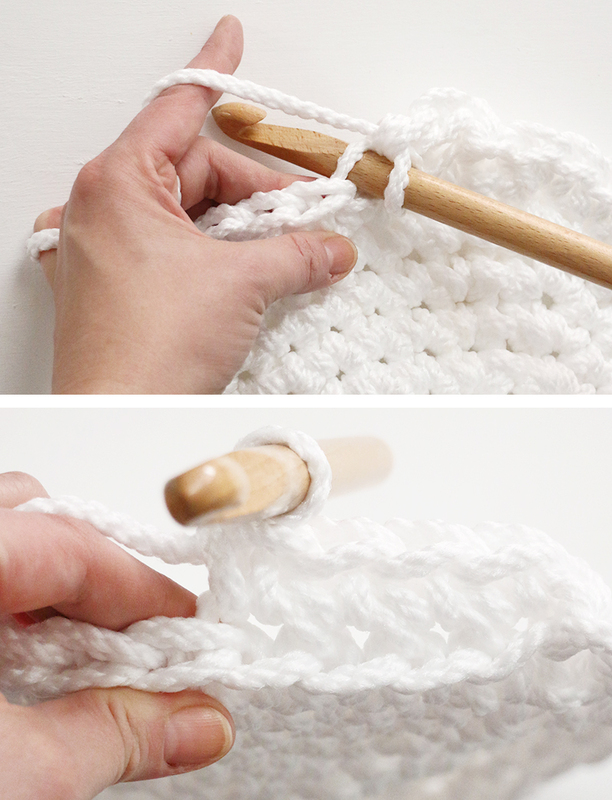 If you go down a size with your crochet hook or use a bulky chunky yarn it works up stiffer. it seems that I loose the dc, sc alternating correctly when the fpdc sequence begins? I love this basket but just like another person, I’m wondering how to make it stand up? Would love if you could make a video on this pattern, you explain so well! Thank you for your time in answering my question. Please make a video for this basket! I’m better with watching than reading as I’m new to crocheting and I’m trying to learn the stitches. I always refer to the written pattern with the video to learn. I made the 30 minute hat both with double strand (for me) and single strand as a gift. They both turned out great. You explain so easily. Thank you. Could I use a 12mm hook with this cord? Would doing so make the basket more sturdy?